AMR Textiles and Fibre Fillings supply into the dynamic Construction industry with a range of niche products. 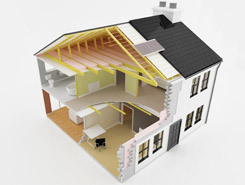 Our range of quality raw materials enable us to tailor our products to provide a unique solution for each Customer, whether they are looking for acoustic and/or thermal insulation, or any other product that the modern construction industry demands. Many years of experience with blending various deniers of fibres allow us to optimise the physical performance of our products.